An absolute treat for your skin! La Flora Organics handmade luxury Bathing Bar is cold processed for 6 weeks to retain natural Glycerine. 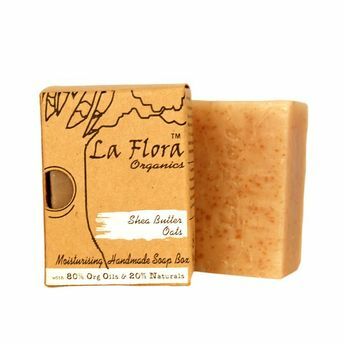 A deep moisturising soap bar made using dollops of unrefined Shea Butter & powdered Oat meal. Shea Butter is a Vitamin A rich moisturiser with exceptional healing properties. Oats contain natural cleansers called saponins that can remove dirt and oil from the pores, contains beta-glucan that moisturises skin.Oats also acts as the scrub or exfoliant on skin.Vanilla bean Oil has antioxidant, antidepressant properties. All of theses hand blended with Organic Veg oils makes your skin super soft, extra moisturised and glowing.